Since 2015, NYC DOT has been partnering with The New School through the Street Seats program to transform 13th Street at 5th Avenue, Manhattan. 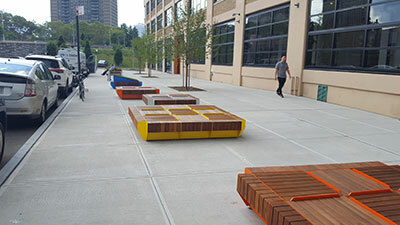 Through this partnership, Parsons School of Design offers a 15 week semester course each spring where students and faculty work together to design, build, and install a Street Seat for all to use. Street Seats is a citywide program where partners apply to transform underused streets into vibrant, social public spaces between the months of March through December (the Season). Street Seats are installed in the roadbed along the curb line or on wide sidewalks to create an attractive setting for eating, reading, working, meeting a friend or taking a rest. The applying partner selects the design and maintains the Street Seat. DOT provides operational elements, such as signage, wheel stop bars, striping on the parking lane, and/or temporary plastic bollards. Review the complete design guidelines. Any type of business or institution that owns or operates the frontage at the ground floor of a building may be eligible to install and maintain a Street Seat. Business Improvement Districts (BIDs) and non-profit organizations without frontage can also be eligible, if they work in partnership with a local business that does have frontage. Additionally, via NYC DOT Sponsorship Agreement, anyone may apply for a Street Seat to be sponsored or anyone may sponsor a Street Seat. 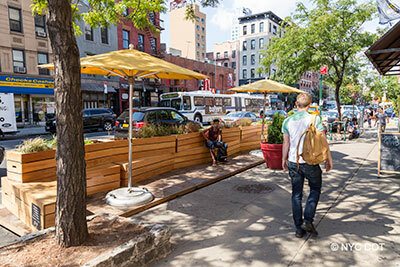 All applications for Street Seats require support from the property owner and approval from the local Community Board before installation can take place. DOT does not charge an application or permit fee. The site must be a pleasant place to sit. 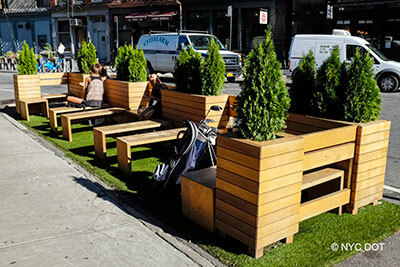 The purpose of Street Seats is to enhance already vibrant street life; there should be complementary adjacent uses. The adjoining sidewalk must be free of major obstructions such as fire hydrants, driveways, newsstands or bus stops. The presence of certain types of underground utilities may render locations unsuitable for Street Seats. The street characteristics must be deemed suitable for such installations by DOT. Sites close to intersections or driveways or where turns or lane changes occur could be rejected due to safety concerns. The parking regulations at the curb must be suitable for the installation cannot be a moving traffic lane at any time of day. Examples of unsuitable regulations include bus stops, fire zones, authorized vehicle parking or no stopping zones. Street Seats are attractive installations that enhance neighborhood streets and provide an amenity to support walking and vibrant street life. All installations must include plantings that screen the seating area from traffic while still providing visual permeability across the street and a continuous open edge along the curb. The installations must maintain roadway drainage, be ADA complaint, and also allow for access to any below-ground utilities. Recommended planting list can be found here. These options are within DOT’s standardized tool kit of approved furniture. Design and implementation costs are greatly reduced when selecting these options. Platform. This option, which is also characterized by a platform that is flush with the curb, is a standard design that DOT licenses to successful applicants. Design costs are thereby eliminated in most cases, but site conditions may still necessitate design solutions that require the drawings that are signed and sealed by a New York State-certified architect or engineer. Please contact DOT for more details. Non-platform. This type of Street Seat is directly on the roadbed. Design and installation costs are greatly reduced with this option. The non-platform Street Seat requires a ramp for wheelchair access; this reduces the amount of space devoted to seating or other uses within the space. Sidewalk Curbside. This type of Street Seat is directly on the sidewalk along the curb line. A minimum sidewalk width of 40’ is required. DOT planters, tables and chairs are provided during implementation. These options require compliance with our Design Guidelines and design drawings must be signed and sealed by a New York State- certified architect or engineer. DOT engineer review and approval is also required. Platform, Customizable Design. This option is characterized by a platform that is flush with the curb for easy access. Non-platform, Custom Design. This type of Street Seat is directly on the roadbed. Sidewalk Curbside, Custom Design. This type of Street Seat is directly on the sidewalk along the curbline. A minimum sidewalk width of 40’ is required. During the months of operation, the installation and surrounding area must be routinely cleaned and maintained by the sponsoring business or organization. Furnishings must be removed or broken down and locked up at night and then put out again each morning. The sponsoring business or organization will enter into a maintenance agreement for the length of the season. Download the agreement template (pdf). To ensure smooth and successful operations, DOT will conduct regular inspections to ensure the Street Seat remains safe, properly maintained, and free from prohibited activity. DOT will order the removal of any Street Seat that are consistently poorly maintained. Partners are responsible for installation, removal and storage of the structure during the off season. All Street Seats are open to the public. The sponsoring business may not take orders nor exchange money on the Street Seat. But if patrons order products inside the business, they may be brought out to them at a table. Smoking and alcohol consumption are not permitted, as will be indicated by signage provided by DOT. Street sweeping by the Department of Sanitation will proceed as normal along the curb in front of and beyond the installation. Partners are responsible for sweeping up to 15’ on either side of the Street Seat. Garbage collection occurs at curb area at the nearest end of the installation. There are four steps in the Street Seats process. Please note that some steps may overlap or may not apply to all design options. Download the application to install Street Seats (pdf). Obtain the support of your property owner or, if you are the property owner, simply sign under “Property Owner’s Affirmation”. Complete and scan the application and submit it via email to streetseats@dot.nyc.gov. See full submission requirements on the application itself. DOT will review your application to ensure it meets our siting criteria and notify you for a site visit. Determine the design option; platform, non-platform or sidewalk. DOT reserves the right to reject any application for a Street Seat for any reason. Contact your Community Board to request a presentation of your proposal as soon as you receive preliminary approval from DOT. Present your proposal to the relevant committee at the Community Board (usually the Transportation Committee) for its review. If the committee approves your proposal, it will forward it to the Full Board for its review and approval. Submit your design drawings to DOT. DOT will review your design drawings and approve them. DOT will develop site drawings showing the placement of the Street Seat, the parking regulation signs (if necessary), the wheel stops and the flexible delineators. Complete any off-site fabrication of the Street Seat, as necessary, per your design drawings or per the standard design. Execute the agreement with DOT and provide the required insurance certificate. DOT will issue a notice granting permission and specify an installation date. DOT will install traffic signs, parking lane marking, wheel stop bars and/or temporary plastic bollards after the installation, if deemed necessary. 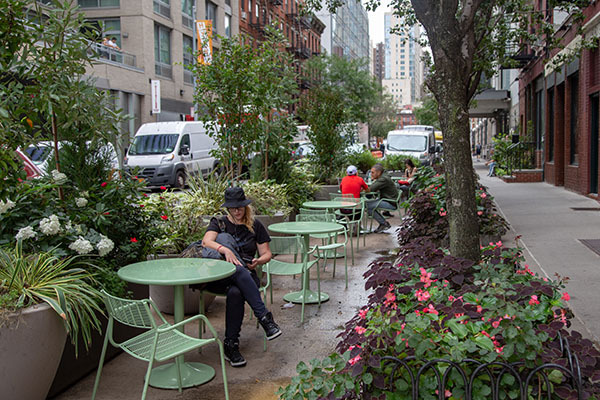 DOT will reimburse NEW partners for up to $12,000 and existing partners for up to $5,000 for the 2019 season for eligible purchases related to materials, fabrication, installation and maintenance of the Street Seat. All purchases and installation much occur before June 30, 2019. Please inquire for further information.